This Modern Bathroom Vanity has large storage capacity and high cost performance. White finish is the top color choice for many of bathroom renovation.Tempered glass surface top is easy to clean up.This set ready to install and you can get it done easily following the installation instruction. It comes with vanity cabinet, ceramic sink , mirror, chrome faucet, pop-up drain, P-trap, and some installation hardware. Its luxury design will surely brighten your bathroom and add value to your property. 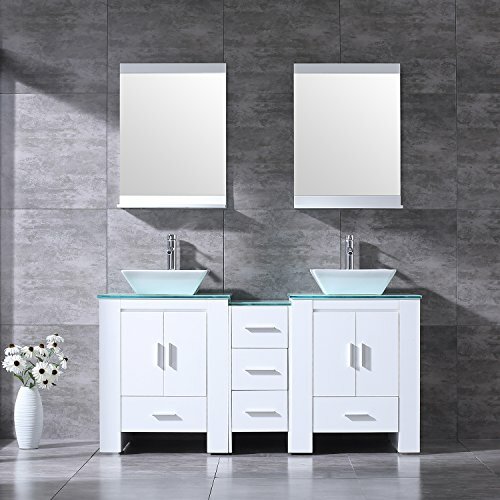 Vanity size: 60"L x 21.5"W x 30"H, Side Cabinet size:11.8"L X 21.7"W X 29.5"H, Mirror size: 29.5"L x 21.7"W, Ceramic sink size: 16.5''D x 4.7''H, Faucet height: 12"